As the name implies, the chamfer on the edge of these boards form a "V" when joined together. 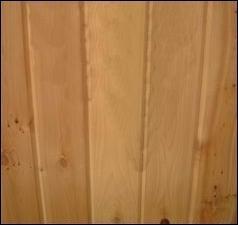 A very popular plank paneling, V-joint is ideal for wainscotting or as a complete wall and ceiling. People tend to only consider white pine for such applications. 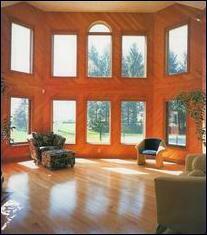 Cedar V-joint is absolutely beautiful and should be used for more than just the sauna or exterior applications. The 3/4" thickness makes it much easier to install, provides extra R-value and has a positive effect on noise reduction. All four sides are planed to an excellent finish. 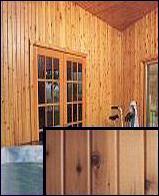 Cedar paneling is primarily in 8' lengths. Pine is available random lengths up to 16'. We certainly try our best to accomodate our customer's length preferences depending upon inventory.